To mark the release of my book, I am doing the biggest grilling gear giveaway I have ever done on Nibble Me This. The book is The Kamado Smoker and Grill Cookbook and it releases on June 24, 2014. (Yeah, I know I have been saying it releases in August but apparently that date has moved up to June*). Here's the official blurb. The ultimate in barbecuing tools, the kamado style grill features a ceramic shell and charcoal pit that allows you to slow roast, smoke, and grill meats to perfection. Packed with recipes, photos, and techniques unique to the kamado, this essential guide will turn grilling neophytes into masters of backyard barbecue. 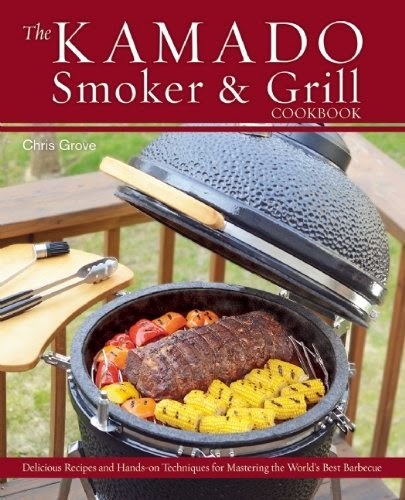 The Kamado Smoker and Grill Cookbook is obviously written for kamado grills, such as; Big Green Egg, Kamado Joe, Vision Grills, Grill Dome, Komodo Kamado, and Primo. It has over 50 techniques that I use when cooking on the kamado and each technique includes an original recipe that uses that method. Whereas I try to write this blog for all grills, the book is specifically meant for the kamado grill and to teach new owners how to use theirs or inspire existing kamado owners to further explore their ceramic cookers. If you don't own a kamado grill you should go buy one and then buy my book! Kidding (sort of - cough cough) but most of the recipes can be converted to a regular grill, just ask me for ideas if you run into that. So here is the giveaway package. I'm excited about this because I'm including prizes from some of my favorite sponsors (although I'm footing the bill for it this time, not them). If you have paid any attention to my blog at all, you have seen this grate relentlessly. I use it constantly and it appears in almost all of my cooking pictures. In addition to being an exceptional cast iron cooking grate that is non-stick and gives gorgeous sear marks, it also has removable inserts that make it easy to add fuel or swap out with one of their unique accessory grates (griddle, veggie wok, or grilling stone). Winner gets the cooking grate (ring and 3 inserts) for an 18.5" kamado and one accessory grate of their choice. If you have another sized grill or if you already have the Craycort main grate, I'd be happy to apply the $100 towards other Craycort sizes or accessories. Thermoworks is THE name in professional cooking instant read thermometers. I had a hard time choosing the prize so I'm not. I'm making YOU choose. 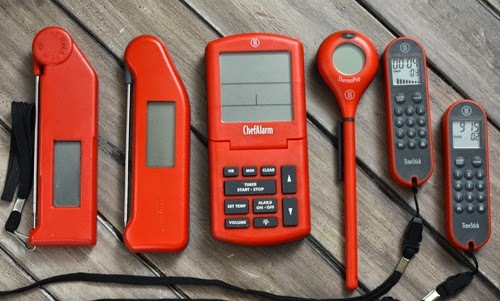 If you win, you can have either a Thermapen in the color of your choice OR a package of the Chef Alarm (remote probe), ThermoPop (instant read), and TimeStick (timer) in color of your choice. 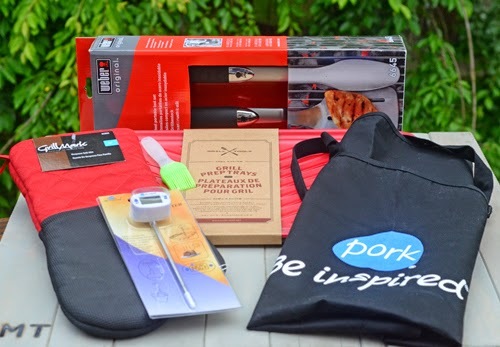 Prize pack from our friends at PorkBeInspired.com, including a set of stainless steel grilling tools (not the cheap stuff), heavy duty neoprene grill glove, prep trays, Pork Board branded silicone basting brush, digital thermometer, and apron. That's easily over $250 worth of some fantastic grilling gear. To enter, leave a comment below telling me whether or not you have a kamado grill and if so, what type. You can have a second entry for a tweet about this giveaway including my twitter handle @nibblemethis so I can find it. NOTE: If you are using the anonymous comment option, please make sure to leave a way to reach you (email, forum user name, twitter etc) in case you win. Giveaway entry period begins as soon as this is posted and ends June 23 at 11:59pm. Drawing will be held June 24th at noon (All times are Eastern Time zone). Winner will be announced in an update to this post. Limited to residents of the continental United States unless you wish to pay the extra shipping charges. Winner must respond to claim the prize within one week of the winning announcement and/or email contact. I do attempt to contact the winner directly if contact information is provided. If a winner does not claim the prize during the specified time, a reserve winner will be drawn from the original entries. *I found out about the change on Amazon when someone noticed the new date and told me. I still haven't heard anything about it from the publisher so if this turns out to be incorrect, I'm still running the contest now instead of August. I have a Vision Classic. I post as Rustwood on the Kamado Guru forums. Rustwood chose a yellow Thermapen to go with his new Craycort cast iron grate, a copy of my book, and the other items.